hahahahaha the perfect designations suggested for those traders of hatred !! you added on to the thought .. thank you !! Actually Hafiz is also the Chancellor of a University and it is anybody’s guess what the courses are all about !! and look at the audacity of this chancellor .. he every now and then warns India ! His University pupils will soon be a pain in his own neck .. I bet !! Hatred never gets you love for long !! Kabhi Aman Ki Asha Thi bhi kya? It’s ‘ladan’ ki asha! :/ Lovely doodle! There’s no control in the line of control….. 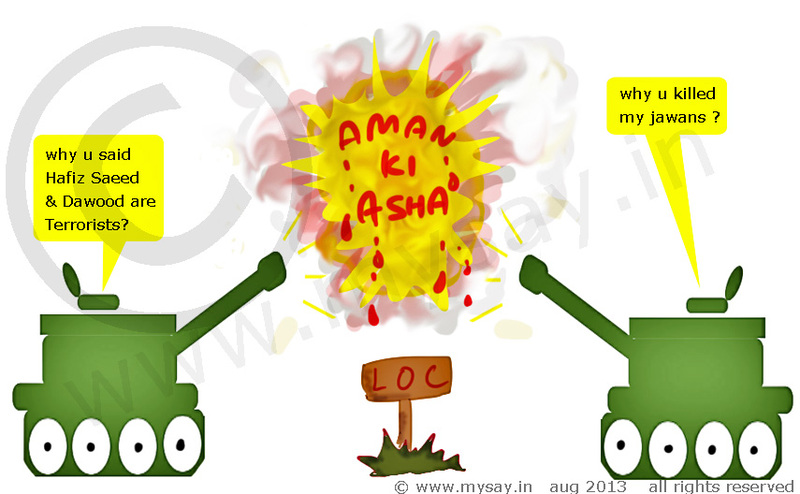 I only wish there was some actual ‘asha’ instead of this farce! The never to end fight! What did we do to deserve this! I am reading “The Reluctant Fundamentalist” and loving it. What struck me as odd is that the main protagonist in the story – a Pakistani guy, is angry at the war mongering tactics of India after the attack on the Indian parliament in 2001. We, in India, generally believe we are the peaceful ones and they are the war mongers – in this case their Lashkar e toiba did the attacking and they are angry at our war mongering. What I’m getting at is how effective the huge propaganda machines seem to be. Their purpose is to keep the ordinary person’s feelings high and to obfuscate the truth. I am of the view that fundamentalists are nothing but partial . Those who are bad with tolerance and acceptance.. religion can be any but the fact these fundamentalists be it following any belief,principal or faith .. do not they are the reason many become like them and worse !! Today Saffron Terror is a fact hidden somewhere but is a reality …justification to violence can be any . but result is continuing disaster … of human and nature !! (i am on no party side, a citizen wants gud administration) what say you about this… Opinion please..
Read carefully again and again, and understand! 15% Muslims, 8% Christians, 7% Others and 70% Hindus. out of 100 people, there are 70 Hindus, 8 Christians, 15 Muslims and 7 Others. 90% of Muslims, 90% Christians and 60% Hindus and 90% Others. out of 100 people, 42 Hindus, 14 Muslims, 7 Christians and 6 ‘Others’ will Register for vote. Out of the registered voters having voter ID or at least having interest in selecting their representative. 50% Hindus will vote, 90% Muslims will vote, 90% Christians will vote and 90% others will vote. now see Out of these 45 people of total population who votes for whom! out of 5 others, 3 will vote for congress. Congress will get 18 non Hindu votes, BJP may get 1 Muslim or Christian and 1 others vote. So what BJP has got? BJP has got 2 non Hindu votes! Other parties, that are third front, may get 2 Muslim or Christian and 1 vote from others. That is, ‘Others’ may get 3 non Hindu votes. now Out of 21 Hindus. Congress 23 votes, BJP 12 votes, other parties will get 9 votes. Congress loses in States where the Muslims do not vote for them. If Congress scares minority from majority, which is easy in the name of burka “secularism”, their 90% work is done….and they have been doing so religiously.. So what is the Mantra to thrash congress? and defeat Islamic Terrorism? well although I may not comment on the numbers dear friend but the result is quite a possibility .. to get out of the grasp of opportunist administration .. even the minorities need to stand by specifically Muslim brothers and sisters with a huge population .. they need to stop being in state of fear … under which they have become far more aggressive.. and they are choosing corruption for the sake of fake safety .. if congress was so secular riots against Sikhs would not have taken place.. and Titler would not be set free .. point is opportunists are all parties but with Modi specifically being the leader ( note I am not pro Modi) i have hopes .. no other BJP leader and in congress there is no one to look upto .. they are corrupt all in all from top to bottom.. I want to ask my Muslim brothers and sisters .. do they not know at least area in every city predominated by Muslims and bears a Pakistani flag ? go to any city !! my question is WHY ? is this Pakistan ? I have no personal problem with Pak’s flag in Indian territory provided they were friendly .. but is Pak friendly at all ? When Kasab got caught many of muslim friends were of the view that he might be picked up from somewhere and may have been portrayed as Pak terrorists .. When India won .. it were many muslim friends who said it was a bought World Cup !! Then their constant support to all corrupt parties .. its sad .. its been 66 plus years and there is only 1 community which is not accepting India as mother land entirely . ( Please note I am not talking about all Muslims .. still the ones who are yet consider India as their own are huge ) This fact is not hidden and is publicly debated many a times. thanks Ankur !! I am glad you dropped by and shared your thoughts – I really do not know but expect things to calm down !! Every time I read about this, I get angry.